Tham Pla – About 17 kilometres from town on Highway No. 1095 (Mae Hong Son–Pai), Tham Pla is a popular attraction of Mae Hong Son. The surrounding areas are brooks and cool hilly forests suitable for relaxation. A special feature is the hollow cave filled with numerous freshwater fish known as Pla Mung or Pla Khang, which is of the same family as the carp. The fish are quite safe from being caught as they are believed to belong to the gods. 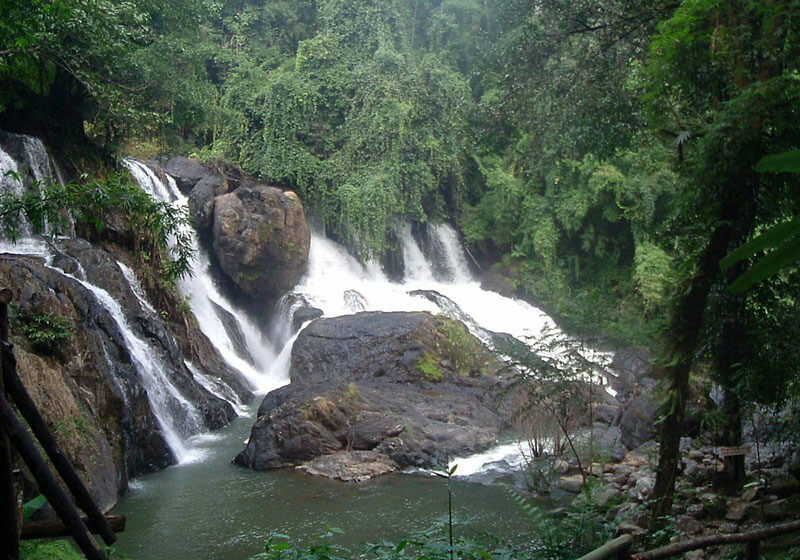 Namtok Pha Suea – This waterfall is in Tambon Mokchampae about 26 kilometres from the provincial seat on Route 1095 to Pai district with a left turn at Km. 191. It is a large fall with its water source in Myanmar and runs full during the late rainy season (August-September). Pang Tong Royal Pavilion – This is a hilltop pavilion at Ban Mokchampae, some 5 kilometres beyond Pha Suea Waterfall. It is open every day from 8.30 a.m.-4.30 p.m.
Short Description: Tham Pla–Namtok Pha Suea National Park is about 18 kilometres (10 mi) northwest of Mae Hong Son in Mueang and Pang Mapha Districts. The park's area is 630 square kilometres (240 sq mi). The highest point is Doi Lan peak at 1,918 metres (6,300 ft) in the Daen Lao Range. The northern and western sides of the park border Burma's Shan and Kayah states respectively.